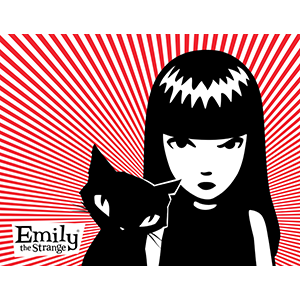 Emily the Strange came to life in the early 1990’s and quickly became a beloved icon all around the world. In her earliest years, Emily was a sharp-witted stranger, slinging philosophy and cultural observations in a series of hand-screened t-shirts and stickers. As her presence grew, Emily’s own story began to emerge in a series of gift books, a full range of apparel and stationary items, toys, comic-books, video games and into a novel series for young adults. 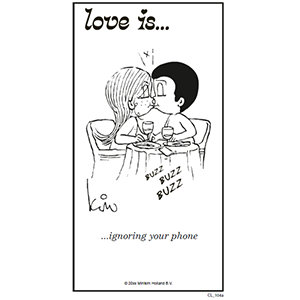 It all started with shy little love notes from Kim Casali to her future husband, Roberto. Each of these little notes involved a small drawing and a personal sentiment that perfectly captured Kim’s thoughts for the man she loved. She would hide these little drawings where he would least expect, sometimes tucked in a pocket or popped under his pillow, and also send them to him whenever they were apart. A curious and talkative bat, an adventure-loving girl and her two bigger brothers - one lazy and the other scaredy-cat - wander around Fogville, a little town that seems quiet… but is not quiet at all! The old buildings and narrow streets are filled up with vampires, ghosts and other scary creatures, and the distant shrieks you hear in the dead of night from the Whispering Woods are definitely not a promising sign. Join Bat Pat and the Silver kids as they embark on a journey to help with the myterious happenings in Fogville; great fun is guaranteed! Episodes available on Netflix and Amazon Video. 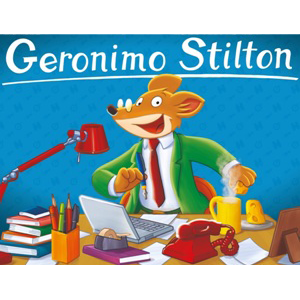 Geronimo Stilton is a worldwide success entertaining children all over the world with over 148MM books sold. Translated in 48 languages with more then 400 titles, Geronimo Stilton is a best-selling children's fictional series, published by Edizioni Piemme. Since 2000, the Italian publisher has produced more than 50 books. Due to the popularity of the series, US-based Scholastic Books began publishing English versions of Edizioni's books in 2004, and the Geronimo Stilton success broadened into the United States. Today, the series is an international best seller and inspires live productions throughout North America, as well as book signings by the main character, Geronimo. The series is targeted toward readers aged 6 to 12. Geronimo Stilton is an animated series featuring the adventures of the most famous mouse journalist. Seasons 1 and 2 have been sold in more than 130 countries around the world, while the latest, and newest season, has already been sold in 60 countries and premiered in more than 30. The series is currently available on the popular Amazon and Netflix streaming platforms. Bela G. Lugosi, son of Bela Lugosi, founded Lugosi Enterprises to preserve and protect the image, name and likeness of his father by honoring Bela Lugosi's place in history as one of the pioneers of the Hollywood film industry and by celebrating his iconic portrayal of Dracula. Bela G. Lugosi serves as president of Lugosi Enterprises and his daughter, Lynne Lugosi Sparks, serves as Chief Operating Officer. The family strives to associate the Bela Lugosi brand with quality products that exemplify the great style and distrinction with which Bela Lugosi approached life, and to introduce Bela "Dracula" Lugosi to a new generation of fans. Read more about Bela Lugosi on Biography.com. Lucha libre is an art form many call “Mexican professional wrestling,” but it is so much more than that. Lucha libre is considered both a sport, as luchadores are considered serious athletes and a spctacle, thanks to the theatrics and showmanship in Mexico. Lucha libre is an industry filled with colorful characters, memorable masks and real life superheros. And now, Masked Republic's Legends of Lucha Libre brand is the first "players association" of the biggest name ICONS, LEGENDS and SUPERSTARS of the lucha world including Rey Mysterio, Blue Demon Jr. and Solar. Masked Republic is the only company in the world "dedicated to expanding luch libre beyond the borders of Mexico"™. Spartan Race fulfills the desire for authentic experiences on a growing global scale, operating in more than 30 countries worldwide. Both a professional sport for the world’s most elite endurance athletes and a participatory sport for athletes of all abilities, Spartan Race has been the leader of the pack and most influential brand to fuel the explosive growth of Obstacle Racing. Spartan Race empowers individuals, friends and families around the world to realize their full potential. Whether seeking a personal transformation, a fun weekend away or elite competition, the Spartan experience galvanizes everyone in a spirit of camaraderie. Find out more about Spartan. 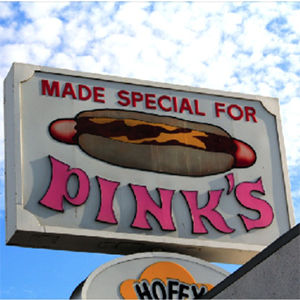 Pink's is the ultimate Mom and Pop hot dog stand. It's a Hollywood love story, starting with Paul & Betty Pink selling hot dogs from a cart on a neighborhood street corner at La Brea & Melrose in 1939. Then the city fell in love with the tasty chili dogs and friendly service, and 75 years later, Pink's has become a Hollywood landmark and internationally famous, now operated by Paul & Betty’s family -- Richard, Gloria, and Beverly. 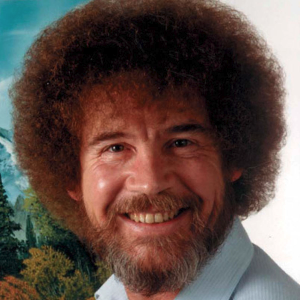 The Bob Ross Company was formed in 1981 and is an active behind-the-scenes organization that today celebrates over 30 years of operation, even after the death of Bob Ross in 1995. His company is as strong and dedicated as ever to his philosophy of bringing art to the masses, and letting his personality guide the daily lives of his friends and fans in a happy, positive way. The wise gypsy: The ever popular fortune teller machine seen throughout the world in arcades and tourist areas. The incredible fascination that has resonated for several decades continues to be one of the oldest and best selling arcade games. 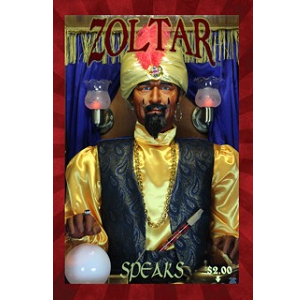 People love to have their fortune told and Zoltar is the iconic image identified with such fun. Chuck E. Cheese's continues to be one of the most popular places in the family fun and entertainment category with high awareness. The iconic restaurant chain that celebrates over 500k birthday parties. Chuck E. Cheese may be a mouse, but he's forever a big kid at heart. Check out Chuck E. Cheese's Online Now! "I basically shoot everywhere I go. I would love to visit exotic locales and take wonderful images but I make do with whatever life throws in my path", says Chris Lord in an interview with Trillium Gallery. Growing up in Brighton, England, Lord was attracted to a small museum/art gallery. The strange things he found there facinated him and influenced the things he is drawn to even today. View Chris Lord's Art Online! For more than a dozen years, an unassuming, quiet-spoken woman dominated Disney design. The stylishness and vibrant color of Disney films in the early 1940s through mid-1950s came primarily from artist Mary Blair. At its core, her art represented joyful creativity and communicated pure pleasure to the viewer. Her exuberant fantasies brimmed with beauty, charm, and wit, melding a child's fresh eye with adult experience. Blair's personal flair comprised the imagery that flowed effortlessly and continually for more than a half a century from her brush. Emulated by many, she remains inimitable: a dazzling sorceress of design and color. Current licensee: Pin Up Girl clothing vintage dresses. 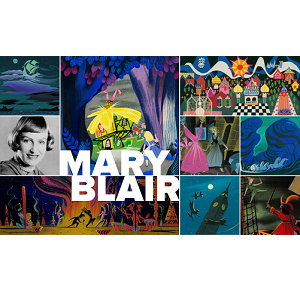 See More of the Magic of Mary Blair. Homefront Girl is a Wife, Spouse, Mother, Daughter, Sister, Fiancee or Friend. She is anyone who has shared her hero with the world. The first lifestyle brand that speaks to the hearts of millions of Americans across the globe. Over 300 plus fashion forward trendy and inspirational designs. Appeals to all military branches. Homefront Girl has a worldwide agreement with Yankee Candle. Click here for more Homefront Girl information. The Quintessential English lifestyle brand with over 60 years of heritage has 88% awareness with women over 30. Laura Ashley is a global brand ranked 29th amongst all retail national brands. Current print ad campaigns include Coastal Living Magazine and Victoria. The Laura Ashley brand has over 100 licensees worldwide. See More Laura Ashley Online. 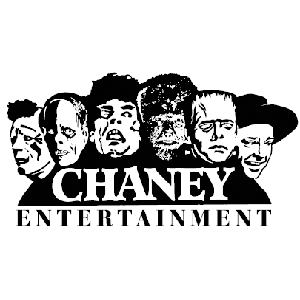 Chaney Entertainment, Inc. was formed in 1992 to preserve and perpetuate the Chaney Family history. The founder of the company, Ron Chaney, serves as CEO and president. To facilitate the corporations’ expansion and growth, his children Jennifer, Jaclynn and Creighton have joined their father to assist with future endeavors, bringing new ideas and reaching out to a younger audience. Visit the Chaney Entertainment Website. Orange County Choppers (OCC) is a world famous custom motorcycle manufacturer founded in 1999 by Paul Teutul Sr. At their facility based in Newburgh, NY, Paul Sr. and his team of custom fabricators design, engineer and manufacture unique forward-thinking motorcycles, built around a theme and, increasingly, for a broad spectrum of motorcycle enthusiasts around the world. 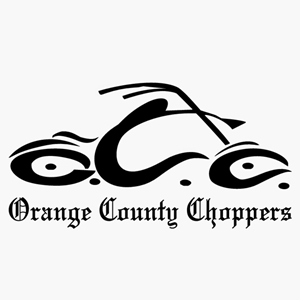 Orange County Choppers has been the center of the hit TV reality series “American Chopper.” American Chopper debuted in September 2002 and remains one of the longest running and most successful reality TV series in history. They continue to entertain millions of people worldwide on a weekly basis. Firefly is proud to manage this popular global lifestyle brand with its US and Canadian licensing. 18 aspiring chefs will brave Ramsay and his fiery command of the kitchen as he puts the competitors through an intense culinary academy to prove they possess the right combination of ingredients to run their own restaurant. The last contestant to withstand the pressure of HELL’S KITCHEN will claim the grand prize. The chefs will have to raise their game if they want to prove to Ramsay that they have what it takes to win. A beloved 70 year old brand and highly recognizable with a wide demographic. Vintage brands are experiencing a major resurgence and popularity and in addition to the nostalgia of this brand it highly resonates with the surf demographic. Hormel is also a Firefly favorite reaching back to the old vintage ads and campaigns that feature iconic logos and brands such as Dinty Moore Chili. 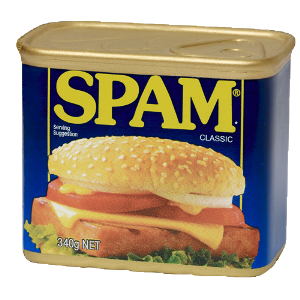 Click here for more SPAM! 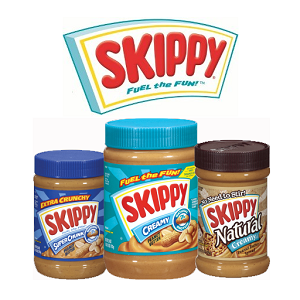 Skippy ® peanut butter has been on market shelves for more than 80 years and is the top selling peanut butter brand. It is a brand that nearly every American knows by name, with 1 in 3 households having a jar of Skippy ® Peanut Butter, and surprisingly it has never been used for licensed products. Hostel is a 2005 American horror film written and directed by Eli Roth. It stars Jay Hernandez and was produced by Mike Fleiss, Eli Roth, and Chris Briggs; Boaz Yakin, Scott Spiegel, and Quentin Tarantino are executive producers. It is the first installment of the Hostel trilogy, followed by Hostel: Part II (2007) and Hostel: Part III (2011). The film tells the story of two college students traveling across Europe, who find themselves preyed upon by a mysterious group that tortures and kills kidnapped victims. Watch the official Hostel Trailer. Clown is a 2014 American 3D supernatural horror film directed by Jon Watts, produced by Mac Cappuccino, Eli Roth and Cody Ryder, and written by Christopher D. Ford and Watts. The film stars Laura Allen, Andy Powers, and Peter Stormare. A loving father finds a clown suit for his son's birthday party, only to realize that it is not a suit at all. Watch the official Clown trailer. Survival of the Dead (also known as George A. Romero's Survival of the Dead) is a 2009 American horror film written and directed by George A. Romero and starring Alan van Sprang, Kenneth Welsh and Kathleen Munroe. It is the sixth entry in Romero's Night of the Living Dead series. Watch the official Survival of the Dead trailer.